Will my spring wildflowers emerge earlier than normal, following the lead of the Iris histrioides 'Katharine Hodgkin' now blooming four to five weeks early in my garden? What does Carol mean "my" wildflowers? Doesn't she know you can't really "own" wildflowers. You can admire them, enjoy them, even wax poetic about them, but you can never own them. Why is that? We are garden fairies, "that" is because we've decreed that it is not possible for anyone to own a wildflower. In fact, the only reason we even allowed Carol to attempt to bring some wildflowers into the garden was because she was rescuing them from a wooded area that was going to be logged out and turned into a lake. If she hadn't dug up a few of these wildflowers, they would currently be in Davy Jone's locker. But she did dig them up so instead they are in her garden huddled around the base of a redbud tree, which is the only half-way woodsy place that Carol has in her garden. We are garden fairies. Isn't that pathetic? So little shade. It's hard on us garden fairies sometimes to find a decent place that isn't in full sun in this garden. But somehow we manage to, and when we do, we always find that Carol has planted as many shade loving plants as she can in those areas. 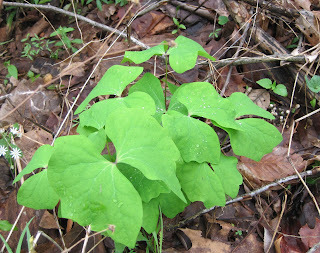 We sure hope the twinleaf, pictured above, and the other rescued wildflowers come up in her garden, or Carol will have nothing to post for Wildflower Wednesday sponsored by Gail at Clay and Limestone on the fourth Wednesday of the month. Whew, that would be bad. We have our garden fairy fingers crossed that these wildflowers that Carol so lovingly and carefully planted in her little tiny spot of woodland garden emerge and flower this spring. Maybe they will even be blooming by the end of March. We are garden fairies. We'll see, time will tell. It always does. Hi Garden Fairies! I am so glad you rescued this post to tell us what was what in Carol's garden. I sure hope you have enough shade to keep you all happy and healthy. I know you are proud of Carol for rescuing those wildflowers, especially that twinleaf. It is divine! I am hoping along with you that the wildflowers will bloom! So nice of her to rescue the wildflowers from certain death! Carol may not own these wildflowers, but she deserves a lot of credit for rescuing them from a tragic fate. I hope you all will help in tending them, too--a little fairy dust will surely help them to thrive! I don't know what Carol would do if you were not there to keep her straight! I know you are constantly alert to any problems that come along. Maybe it was you who suggested she rescue those wildflowers! So glad she did. Plant rescues are great fun, plus you can know you're doing good.